Watch this first, if you like: Waylon Lewis of elephant talks with Richard Karpel, CEO of Yoga Alliance. These sage words came from President and CEO of Yoga Alliance, Richard Karpel. Richard was kind enough to devote his time to a discussion on Waylon Lewis’s Walk The Talk Show about the future of yoga and the role Yoga Alliance plays in it. If you have a vested interest in the international yoga community, it’s worth wading through the hour for yourself. Though, at times, you’ll be confused about what exactly Yoga Alliance does and doesn’t do. “Credentialing is the umbrella term. What we specifically do is a registry. A lot of people will say certification or accreditation, but that actually isn’t what we do. We’re a registry. If you’re a school that promises to uphold our educational standards then you are registered with us in our directory,” explains Richard. Based on the definition of a credential, it’s an understandable point of confusion. Credential: A credential is an attestation of qualification, competence, or authority issued to an individual by a third party with a relevant or de facto authority or assumed competence to do so. See why everyone is confused? Yoga Alliance does have standard curriculums for yoga teacher trainings. Schools and teachers must have certain qualifications to register their teacher training programs, and they promise to follow the YA standards. In turn, any student who completes a registered training gets to register automatically, with a fee, of course. And, when they register, they get one of these marks. But, Yoga Alliance, admittedly, has never provided any oversight to make sure the registered training programs are producing a standard, desired result—new teachers that can guide students competently and safely. Nakedly, all these marks indicate without any oversight is that a teacher who promised to teach students according to Yoga Alliance’s curriculum standards, got paid for a teacher training, and Yoga Alliance collected registration fees. “That’s been one of the issues with Yoga Alliance over the years, is that’s all we did. We took the papers, schools would hear from us once a year when we sent an invoice, and we didn’t have much oversight otherwise,” explains Richard. There are many reasons for this. One, is because it’s really hard to do, and the other is because they don’t want to be the Yoga Police. “In the beginning, Yoga Alliance wanted to come up with a system that didn’t dictate how yoga was going to be taught so they selected a registry model. Which is great for honoring that diversity. It’s not so great when you’re trying to provide oversight, and that’s the big challenge,” Richard explains. People have been voicing it for many years. Yoga Alliance says they’re finally listening and have already taken their first step to adding more rigor to their registry standards. In December 2013, they implemented a social credentialing system which requires every student who completes a training to answer questions about their training. Think Yelp for teacher trainings, but, with a few important differences that Richard points out. 1. All reviewers are verified, real people. 2. Reviews are not anonymous. 3. Objectivity is promoted by asking specific questions. 4. The feedback is systematic, meaning, everyone who has completed a teacher training and wants to register has to complete the review. “So the yoga students are in the best position?” Waylon joked in response. Basically, the answer was yes. New teachers will be evaluating their elders in the first step toward creating oversight over the quality of teacher trainings. It’s vital to note that the reviews are attached to registered schools, not individual teachers. Richard does hint at a deeper motivation for social credentialing which is that credentialing systems, errr, registries like Yoga Alliance are being disrupted by the social review sites like Yelp. 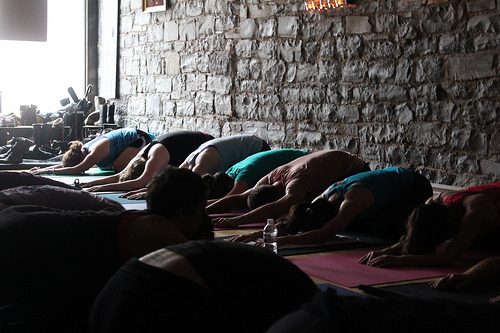 “Yoga studios are already being evaluated by Yelp. What we’re afraid of is that credentialing organizations like Yoga Alliance are going to be disrupted by the Yelps of the world. So there may no longer be credentialing organizations like Yoga Alliance or our influence will be much less than it will be now. That would mean the yoga community’s fate would be left up to the Yelps and Googles and so we thought it was our responsibility,” explains Richard. Yoga Alliance may be a non-profit organization, in service of the yoga community, but it’s still a business that took in $3.37 million in 2012, holds approximately $3 million in total assets, and is growing with the yoga industry each year. Businesses that provide questionable or confusing value should be worried about disruption. No matter what Yoga Alliance calls it, the world thinks their registration indicates a certain level of quality in schools and teachers. It’s likely that Yoga Alliance can’t promise this because it would make them liable in the case of an injury caused by one of their registered teachers. Now, Yoga Alliance has started to do some great things for the community. Like, when they helped defend the case of Sedlock v Baird in Encinitas, California, where people wanted to shut down a school yoga program. Its survival was a huge win for our community. They also act as a professional organization for the growing business of yoga. They’re providing educational resources and benefits for studios and teachers to help increase professionalism in the industry. YA is even in the process of implementing a long-overdue ethics policy that will have an enforcement mechanism to remove ethics-violators from the registry. This will roll out sometime next year. This is all wonderful, but the one thing the world expects them to do, they don’t do. And, maybe they can’t do. Fair enough. Yoga Alliance can only do their best, just like each one of us. They can’t make people be honest or trustworthy and coming up with universal standards for yoga is an extremely complex task. Unfortunately, it’s not nearly as simple as that last statement. People need a way to find safe, competent teachers. Everyone thinks that’s what Yoga Alliance registration indicates, and there are no other universally recognized credentialing systems. Some individual schools do provide rigorous certifications, but teachers continue to register with Yoga Alliance because it is widely recognized by the public as an indication of quality. So what do we do as a community? Do we replace Yoga Alliance with another organization that competes to solve the same problem? Do we self-regulate, with each school or style providing their own standards and forget about a universal standard? Do we engage the organization that claims to act as a steward for our community and attempt to work together to get what we all want? Yoga Alliance has the funds, worldwide recognition, and the beginnings of the infrastructure to potentially accomplish what we all want them to. They claim to be stewards for our community and appear to be open to truly engaging with us for the first time in years. It seems silly to me to start from scratch without trying to engage them first. Yoga Alliance doesn’t do exactly what everyone expects them to do and their lack of oversight throughout the years may seem unforgivable to many, but do you have a better solution? If Yoga Alliance can't actually verify the people they credential, perhaps they should leave the job to someone else. Their job seems to be not unlike the credit rating agencies (S&P, Fitch et al.) who get paid by the very businesses they rate (i.e., provide the credentials for). It is a huge conflict of interest…. which led to the 2008 crash. In my opinion, Yoga Alliance is harmless but mostly useless. I'm looking at a teacher training that's not registered with Yoga Alliance – I'm curious to know how much the RYT credential matters in terms of finding places to teach. Is RYT the usual requirement that studios ask for when hiring new teachers? I don't necessarily feel that YA is the end-all-be-all authority when it comes to quality education (as others have discussed here), but like you said, it's what we have, and it does bear a lot of weight. Any thoughts on education outside the YA spectrum? Disclaimer: For better or worse, I was one of the original members of the ad hoc committee that first came up with the 200 and 500 hour standards. *“This certifies that the person named above showed up for [some/most/all] of the indicated session and appeared to be awake, though there’s no way for me to know whether they were listening or whether they [absorbed/understood] what I said – let alone how effectively they will choose to communicate it. Additionally, there is no way for me determine the teaching ability or qualities of the person named above, regardless of how much I may have [liked/tolerated] [him/her]. Cole Lehman survives on stories, yoga, and new experiences. He’s an INFP, a yoga teacher, and a freelance writer who was raised by books, the internet, and his lovely parents. The mountains are his home and deserts are his favorite places. He believes that this is only one of many worlds we all get to explore and that it’s a privilege to share the experience with you. You can follow his journeys on Twitter, Instagram, Google+, and his website.